Dr. Jocelyn Hogan received her Doctorate in Veterinary Medicine from Kansas State University in 2009. From there she moved to Baton Rouge, Louisiana (LSU) to complete an internship and residency leading to specialization in small animal internal medicine. 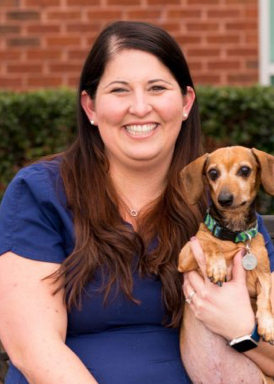 Dr. Hogan joined the Upstate Vetteam in 2013. She likes all aspects of internal medicine but is particularly interested in immune-related and infectious disease. When not at work, she enjoys spending time with her husband, four dogs (Wilbur, Walter, Big Mac, Gladys) and cat (Copper), cheering on the Wake Forest Demon Deacons, and enjoying all the wonderful outdoor activities Greenville has to offer.